"Look! Up in the sky! It's some birdseed! It's a packet of airline peanuts! It's Superkernel!" That little bit with Batman was surreal. 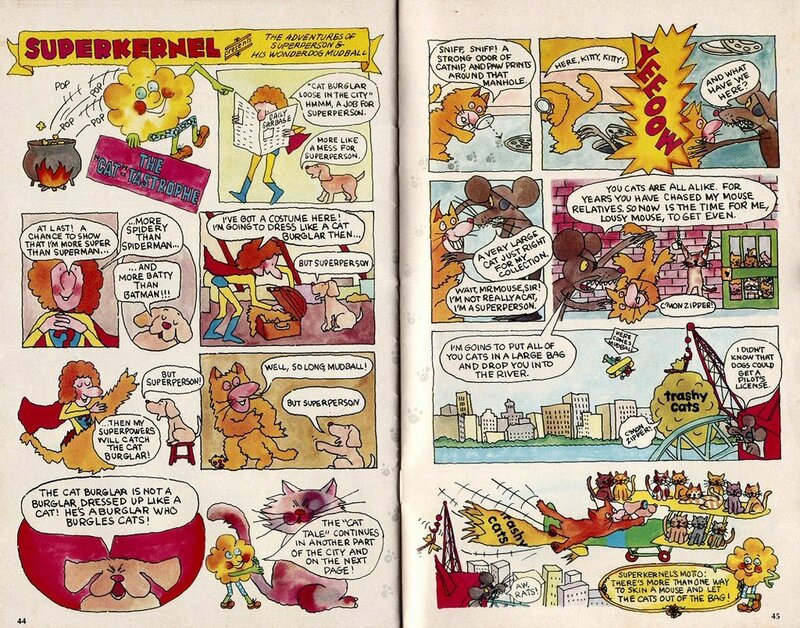 Superkernel must have been a bigger hit with readers than Doug Henning and his Wonderdog 'cause the Kernel would be graduating to his own book while those two would all but disappear from later issues of Supermag. The Weekly Reader Book Club even got itself renamed to 'The Popcorn Bag' in honor of the hero. 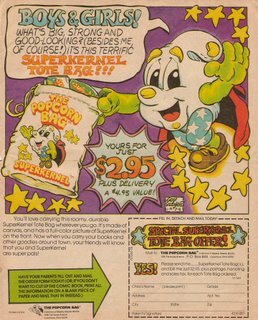 The Superkernel in these two ads would be the one featured in the comics... as you can see, he's much more fleshed out than proto-Kernel was. Gone are the rosy cheeks and rough edges and added was a spiffy red cape. He also lost about 80% of his buttery coating. The ad on the right shows the further evolution of the character. His head/body and nose are much rounder and his arms and legs just a bit chunkier, giving him a 'cuddlier' all around look. The random butter specks have become more defined as well; two eyebrows, a spit lock, a dimple and a gin blossom. 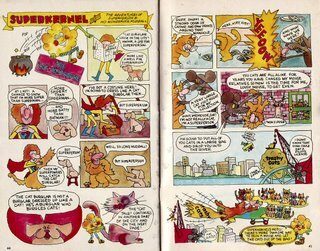 Now Superkernel was ready for the big time- his own comic book! 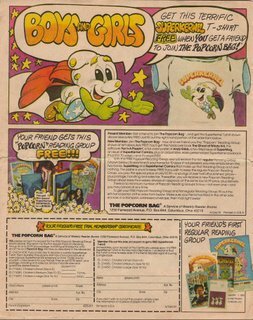 An issue of 'Superkernel Comics' was added to every book club batch sent out to faithful subscribers. 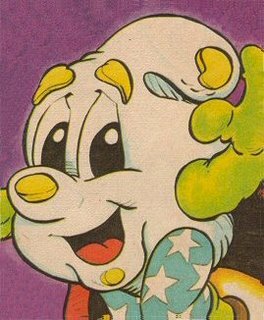 Created by cartoonist Guy Gilchrist, the comic followed the vaguely Pogo-esque, sorta Harvey Comics Enchanted Forest-like exploits of the Kernel of Steel and a mind-boggling wide cast of supporting characters as they battled (well 'tangled with' is maybe a better term. Or 'had words with', perhaps? This was one very non-violent comic) a gang of nasty bug creatures known collectively as the Ugbugs. 'Superkernel Comics' ran for at least four years in the late '70's, that's longer than 'Night Nurse', 'Black Goliath', 'Brother Power, The Geek', and every book put out by Atlas Comics combined. If for no other reason than this he deserves some props! 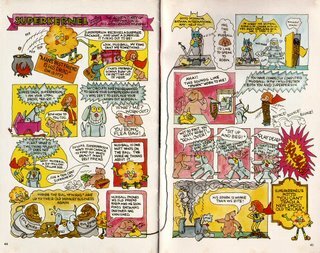 The next three posts here at Plastic Pumpkins will all focus on 'Superkernel Comics.' First a look at the cast of characters, next a gallery of the covers of all the issues I've managed to hold onto over the years and then a reprinting of the Secret Origin issue of 'Superkernel Comics' in it's entirety. Oooh! Thank you for posting this! 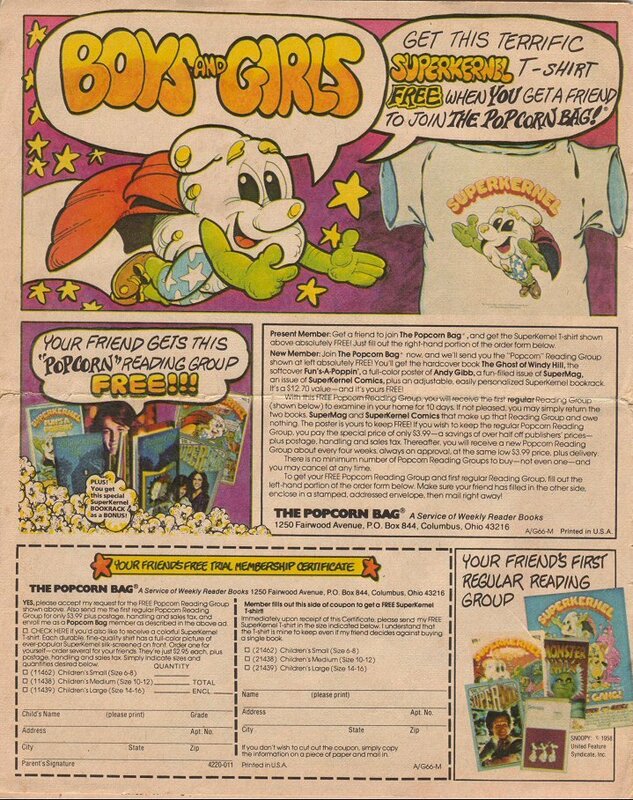 I had a subscription to The Popcorn Bag when I was a kid. Nice memories. 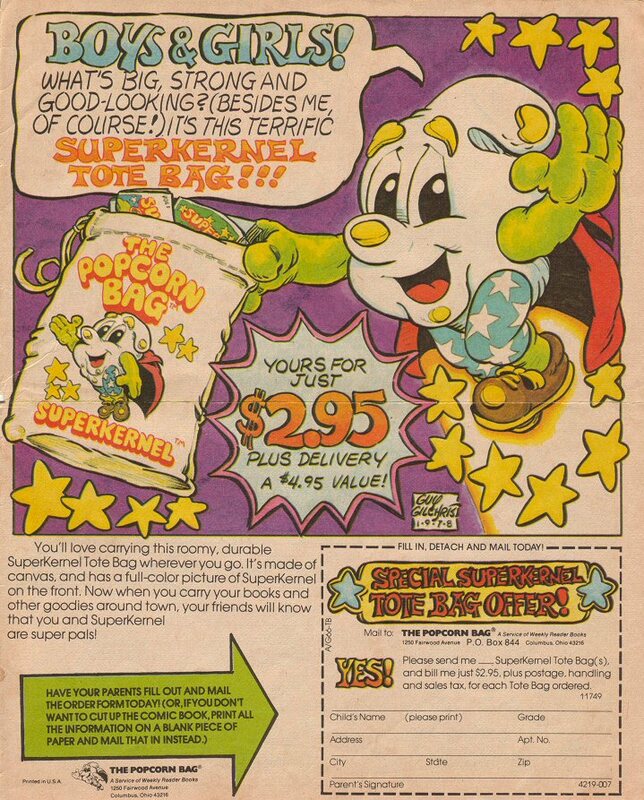 Wow, I absolutely LOVED my Popcorn Bag packages that came in the mail! In fact, I still have a few of the books: "The Ghost of Windy Hill," "The Boy Who Saw Bigfoot," "Peanuts' Snoopy," "The Rise and Fall of Ben Gizzard," etc. Between that club, school book orders, trips to the library, and enjoying what my family had at home, I became a bookworm early in life.